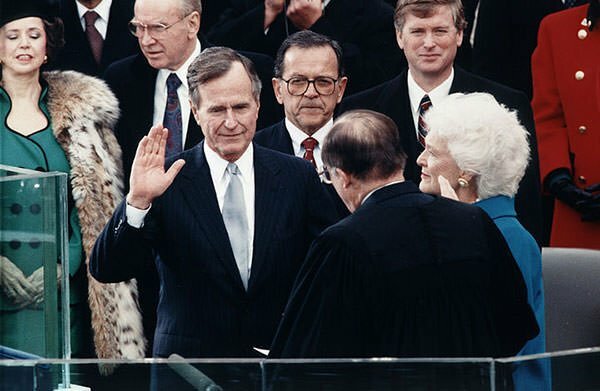 George Herbert Walker Bush (1924 – 2018) served as the 41st President of the United States of America from January 20, 1989 to January 20, 1993. Prior to entering politics, Bush served as a pilot during the Second World War. In politics, he held a number of important posts before becoming president including that of the Vice President under Ronald Reagan. Bush was known as a notable statesman, public servant and for his restrained but firm approach to diplomacy and foreign relations. In domestic policy, Bush signed the landmark Americans with Disabilities Act in 1990. In foreign policy, he helped guide the US and the world through several major global events including the Cold War and the Gulf War. Here are the 10 most important accomplishments of former President and accomplished US politician George H W Bush. After graduating from Phillips Academy in Andover, Massachusetts, George Herbert Walker Bush immediately enlisted in the US Navy Reserve on June 12, 1942, his 18th birthday. The following year, he became the youngest pilot in the Navy at the time. 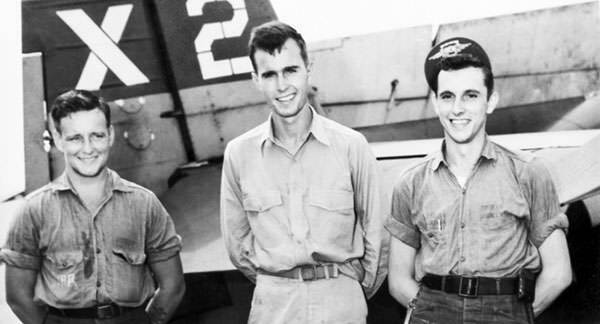 World War II had already begun and George H W Bush flew 58 combat missions during the war. In 1944, his aircraft was shot down in combat by the Japanese over the Pacific Ocean. Two of his comrades were killed in the attack, but he survived. He landed in the sea and waited in an inflatable life-raft for hours before he was rescued by the lifeguard submarine, USS Finback. For his bravery and service during the war, George Bush earned the Distinguished Flying Cross, the oldest military aviation award in the US. Bush was the last US president to have served in combat. Before being elected President of the United States, Bush served as an active politician in a series of high-profile appointments. In 1964, he became chairman of the Republican Party of Harris County. In 1966, he became the first Republican ever to represent Houston, Texas, in Congress. In 1971, he was appointed US Ambassador to the United Nations. The contacts and relationships formed during his term as ambassador would later go on to serve him well both during his presidency and after. 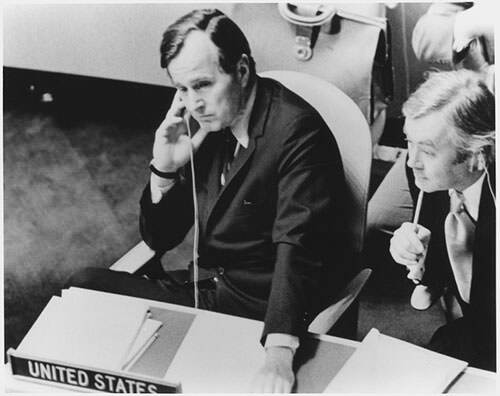 In 1973, then-President Richard Nixon removed Bush from the United Nations position and asked him to serve as Chairman of the Republican National Committee instead. After Gerald Ford became President, Bush stepped down as head of the RNC. In 1974, President Ford appointed him as the US envoy to the People’s Republic of China. In January of 1976, Bush was appointed as the 11th Director of Central Intelligence. He resigned from the CIA in January 1977 after Democrat Jimmy Carter was elected President. Bush made a run for the presidency in 1980, but failed to win the Republican Party’s nomination against his opponent Ronald Reagan. Despite his loss, he was chosen as Reagan’s vice-presidential running mate. Reagan defeated the incumbent Democratic candidate Jimmy Carter to win the presidency in the 1980 election. During his vice presidency, Bush had the responsibility of federal deregulation and anti-drug programs. 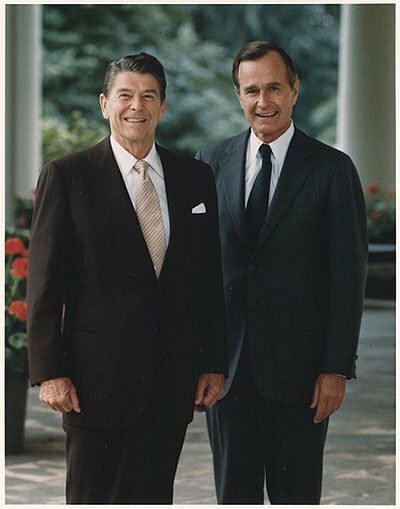 After Reagan was re-elected to serve a second term as president in 1984, Bush continued to serve as his vice-president. After serving two-terms as vice president under President Reagan, Bush sought the Republican presidential nomination in 1988. Bush ran for president in the 1988 election and defeated his Democrat opponent Governor Michael Dukakis of Massachusetts. Bush won 426 electoral votes and more than 53 percent of the popular vote as compared to Dukakis’ 111 electoral votes and 45.6 percent popular vote. George H W Bush was the first sitting vice president to be elected president since Martin Van Buren’s victory in 1837. He lost the 1992 presidential election to Democrat Bill Clinton. 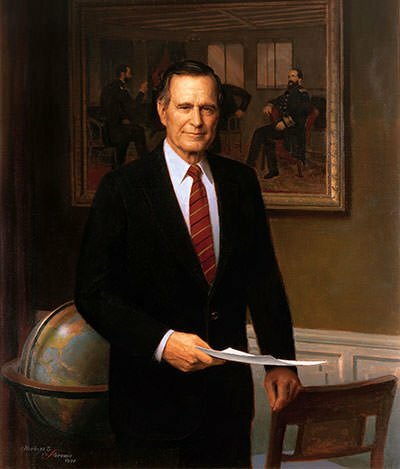 George H W Bush served as the 41st President of the United States from January 20, 1989 to January 20, 1993. Bush also set the record for being the longest living President in US history. He set the record in 2017 when he reached 93 years and 166 days, surpassing Gerald Ford. The passage of the landmark Americans with Disabilities Act (ADA) was one of the most prominent domestic policy accomplishments during Bush’s presidency. It impacted over 43 million Americans. Bush signed the comprehensive piece of civil rights legislation into law in July 1990, giving people with handicaps access to facilities and prohibiting discrimination in employment, public accommodations and transportation. Over the next two decades, doors, stairs, sidewalks, signage and employment laws were revised across the country in response to the legislation. Another important legislation signed into law by Bush was the Clean Air Act Amendments of 1990. In May 1989, Panamanian leader Manuel Noriega annulled the results of a democratic presidential election in which Guillermo Endar defeated a candidate backed by him. He also suppressed a military coup and protests against his rule. 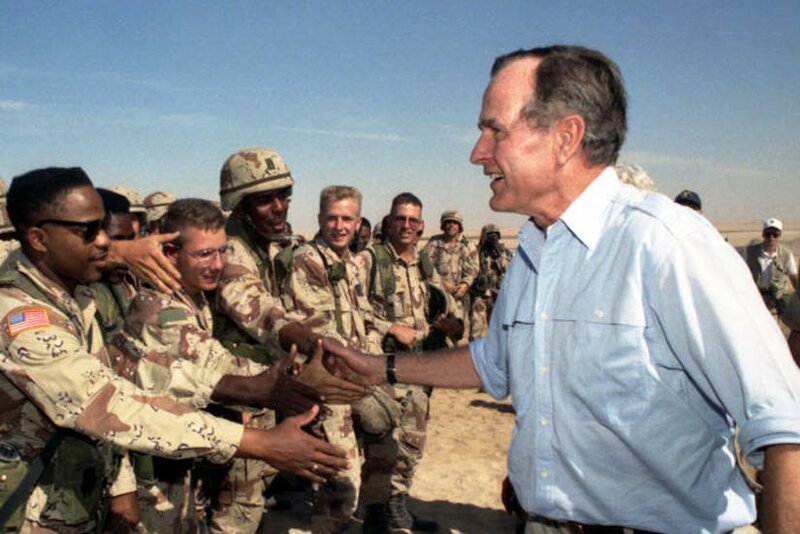 President Bush severely objected to the annulment of the election and dispatched 2,000 soldiers to the country. After an American serviceman was shot by Panamanian forces in December 1989, President Bush sent 24,000 troops to Panama with the objective of removing Noriega from power. The operation was named “Operation Just Cause”. The United States forces quickly took control of the Panama Canal Zone and Panama City. On January 3, 1990, Manuel Noriega surrendered. He was transported to a prison in the United States; and was convicted and imprisoned on racketeering and drug trafficking charges. In Panama, Guillermo Endar, who had won the election, took office as president and served until 1994. This successful interference by American forces is regarded as a major foreign policy achievement of George H W Bush. In August 1990, Iraqi forces led by President Saddam Hussein invaded Kuwait. President Bush strongly condemned Iraq’s actions. He imposed economic sanctions on Iraq and assembled a multi-national coalition in opposition to the invasion. A military operation called Operation Desert Storm was then launched by the United States to remove Iraqi forces from Kuwait. After five weeks of air offensive and bombing of Baghdad, the US-led coalition forces marched into Kuwait to drive out the Iraqi troops by February 27, 1991. A cease fire was arranged on March 3. The UN then passed a resolution establishing a peacekeeping force in a demilitarized zone between Kuwait and Iraq. The Gulf War victory sowed the seeds for cooperation with Arab countries that had long distrusted the United States and led to a renewal of efforts in the Mid-East peace process. Although Ronald Reagan is lauded for ending the Cold War, the ultimate collapse of Soviet communism occurred during the presidency of George H W Bush. After the fall of the Berlin Wall in 1989, Bush met with Soviet leader Mikhail Gorbachev at the Malta Summit. During the summit, Bush and Gorbachev declared an end to the Cold War. Moreover, Bush successfully pushed for the re-unification of Germany. After the Malta Summit, Bush continued to have cooperative relations with the Soviet Union throughout the rest of his term. In July 1991, Bush and Gorbachev signed the Strategic Arms Reduction Treaty (START I) treaty, which was the largest and most complex arms control treaty in history. In January 1993, Bush and Russian president Boris Yeltsin agreed to START II, which provided for further nuclear arms reductions. In 1989, students in China protested against the government for various issues including rising inflation and restricted political participation. The Chinese People’s Liberation Army (PLA) violently suppressed the demonstration in Beijing in what became known as the Tiananmen Square Massacre. Outraged by the incident, Bush imposed economic sanctions and cut military ties with China. He was ultimately able to convince the PRC to release imprisoned dissidents. Other major foreign policy achievement of President Bush include the North American Free Trade Agreement (NAFTA), a free trade agreement between the United States, Canada and Mexico. NAFTA eliminated many tariffs between the three nations and also restricted patents, copyrights and trademarks. It was signed in December 1992 during the presidency of Bush. However, it came into force on January 1, 1994 during Clinton’s presidency. During the presidency of his son, George Bush Senior gathered international support for disaster relief following the devastating 2004 Tsunami in Indonesia and 2005 Hurricane Katrina in the United States. Bush, along with Bill Clinton, toured the tsunami-affected areas in Indonesia, Sri Lanka and the Maldives in the aftermath of the disaster. They appeared on television encouraging aid for victims of the two disasters. They also launched the Bush-Clinton Katrina Fund to assist in relief efforts. Within the first few months, the Fund raised more than $100 million in donations. 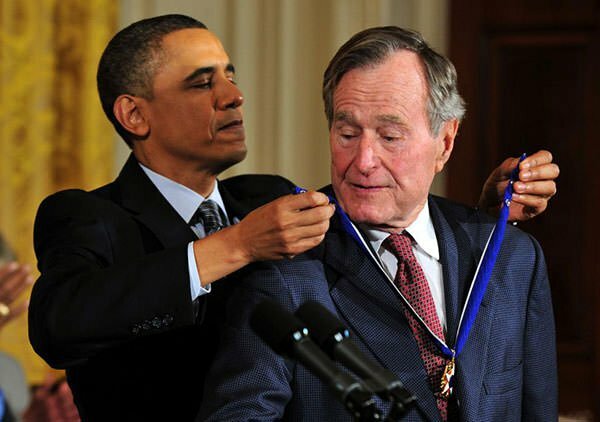 In 2011, President Barack Obama awarded George H. W. Bush the Presidential Medal of Freedom, the highest civilian honor in the United States.